In the main object, AKA Subject, create a Event. Also add create a signature to the event. Create class with Event Handler method for the event of the Subject. Inherit the Subclasses for different behavior. Redefine the event handler method for which any behavior is required. Register the event handler using the statement SET EVENT HANDLER ... FOR O_SUBJECT. Lets see the UML for the example. We have a Subject class as MAINPROCESS. This class has the event as STATE_CHANGED. We would trigger the event whenever there is any change in the state of the object. Thus, we raise the event when we set the new status of the object – attribute CURRENT_STATE using the method SET_STATE( ). We have an abstract super class MYFUNCTION. We created event handler method ON_STATE_CHANGED for the event STATE_CHANGED of class MAINPROCESS. We inherite two classes MYALV and MYDB from it. We redefine the methods to refresh their status. Here is the Code lines. METHODS: set_state IMPORTING iv_state TYPE char1. EVENTS: state_changed EXPORTING value(new_state) TYPE char1. WRITE: / 'Main Process new state', current_state. RAISE EVENT state_changed EXPORTING new_state = current_state. CLASS myalv DEFINITION INHERITING FROM myfunction. 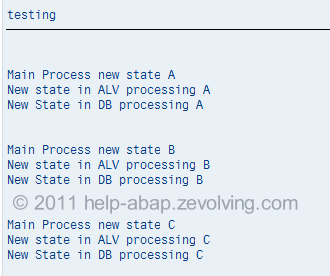 WRITE: / 'New state in ALV processing', new_state. CLASS mydb DEFINITION INHERITING FROM myfunction. WRITE: / 'New State in DB processing', new_state. DATA: lo_process TYPE REF TO mainprocess. DATA: lo_alv TYPE REF TO myalv. DATA: lo_db TYPE REF TO mydb. SET HANDLER lo_alv->on_state_changed FOR lo_process. SET HANDLER lo_db->on_state_changed FOR lo_process. When we call method SET_STATUS of the object LO_PROCESS, it raises the event STATE_CHANGED. This would be caught in the event handler ON_STATE_CHANGED. This is possible with the statement, SET HANDLER lo_alv->on_state_changed FOR lo_process. Don’t miss to read, The Case Study: Observer Design Pattern Usage to know more about how observer can be implemented in real-world.